Goodbye little Pound, Hello Design Team! Did I Mention TV Adds 10 Pounds? 15 Years & Ready for S'more! 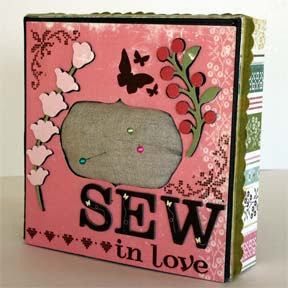 Here is the other sewing box that I promised to show you. I filled this one with fat quarters (for those that don't quilt, this means 1/4 yard of fabric cut wide). 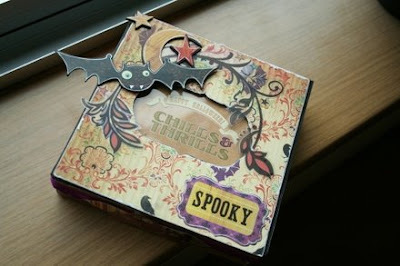 Anyway, I think this one is cute too and is just another example of the fun gifts you can create with crafting stuff! It seems that I've fallen off the wagon and need to go back to my Chocolate's Anonymous meetings. My name is Julie Comstock and I'm a chocolaholic. Since the dawn of Cosmo Cricket time, we have been making altered cigar boxes. This one here is a variation of one we displayed at our very first show, CHAS 06. 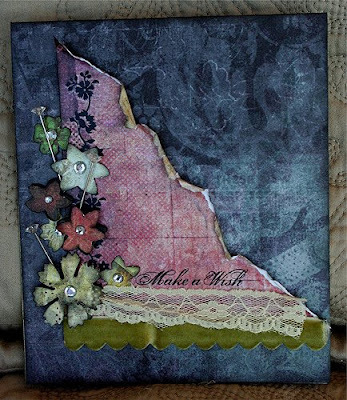 I changed it a little so that the emphasis is more on storing scrapbooking embellishments rather than on sewing. I filled it with buttons, ribbons, thread and fabric because that's what I have on hand. Any embellishments would be cute. Think flowers, decorative brads, matching glitters, a cute block stampe, etc. I plan to go get some of the pretty, decorative pins that Leah Killian used on her card in a previous post. 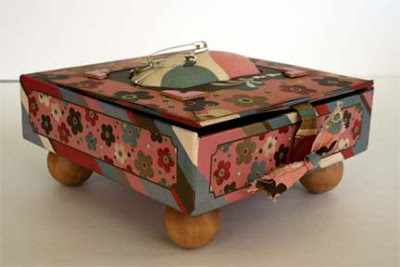 I think this box paired with some Jitterbug paper will be a fabulous gift, especially for a friend that has tons of paper, but never gets anything to go with it! 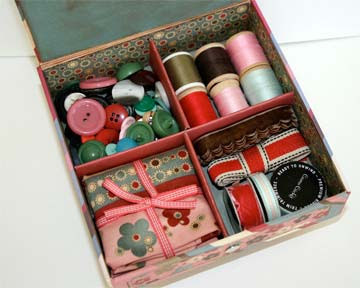 I have a second sewing box that is made with a Blackboard cigar box and our Honey Pie line, but I left it at the office. Eric will bring it home and then I'll photograph it so you can see it too. You'll need paper (I used Hello Sunshine Berries, my kids used Oh Joy, but even newspaper or pages from magazines can make beautiful beads), Ultra Thick Embossing Powder (UTEE), child's paint brush, embossing heat gun or melting pot and glue (I like Tacky Glue for this project). You will also need a little aluminum foil or something similar as a work surface so that you don't end up embossing your countertop! 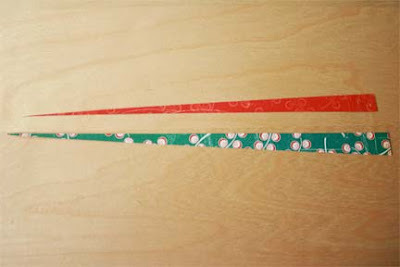 The way you cut your paper will determine the shape of your beads, but generally a long, skinny triangle is what I use. 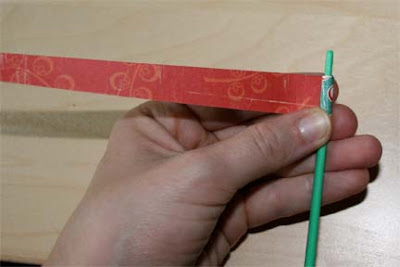 Using the end of the paintbrush, wrap your triangle starting with the wide end. 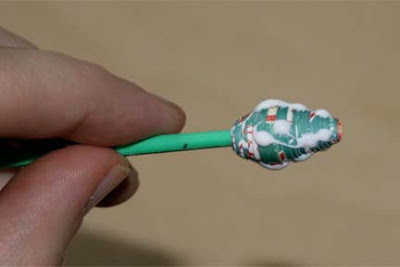 When you get near the end of wrapping, put some glue on the end to hold it in place. 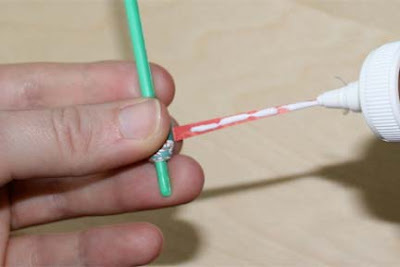 I use more than needed so that the extra glue spreads out giving the bead more strength. 6. If you have a melting pot, simply dip your beads in melted UTEE. If you don't and you don't want to purchase one..... read on. 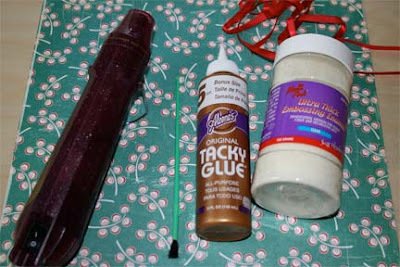 Using the Tacky Glue, coat the bead with a thin layer. 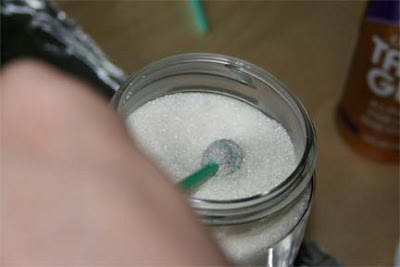 I dab it on as shown, then use my fingers to spread it out into a very thin allover coating (almost wiping it all off). If your glue is too thick, it will make the embossing powder foam. You just need to make the bead tacky enough to hold the embossing powder to it. With bead still on end of paintbrush dunk it in the UTEE. If there are some areas that don't get coated all the way, don't worry. 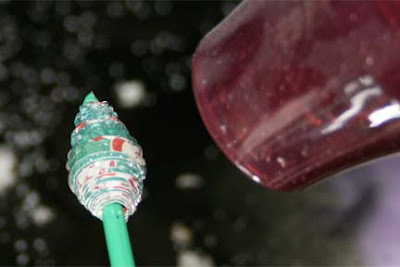 Using your heat gun, with the bead on the end of the paintbrush, heat the UTEE. Continually turn the bead. When the UTEE starts to melt it will look like little beads of water. Continue to heat it until they run together and start to coat your bead. If you are like me, you'll want a super glossy and smooth bead. 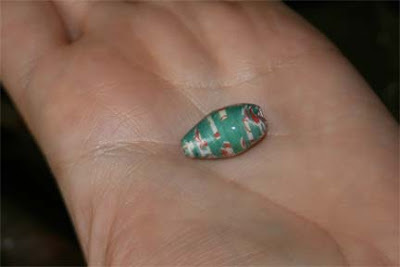 In that case, when the bead starts to look coated, re-dip it in the UTEE. Then heat again. I do this 2-3 times depending on the bead and look. When you get more than one or two coats of UTEE, it will want to run and drip so make sure that you continually turn it until it is cooled. 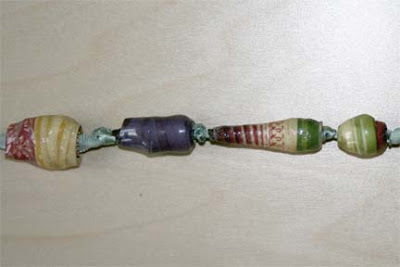 Don't worry if your bead looks like it is glossed onto the paintbrush, when it is cooled, your be able to just twist it off. 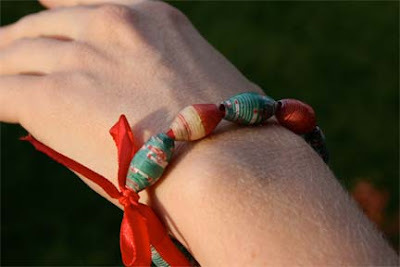 String your beads on ribbon or elastic to make cute bracelets and necklaces. It's so easy, even a six year old can do it. Here is Abby's bracelet. I didn't let her use the embossing gun, since I didn't want her to burn off her little fingers, but she rolled the beads all by herself and strung the bracelet. Congratulations Stine66, send us your address and we'll send you a prize! 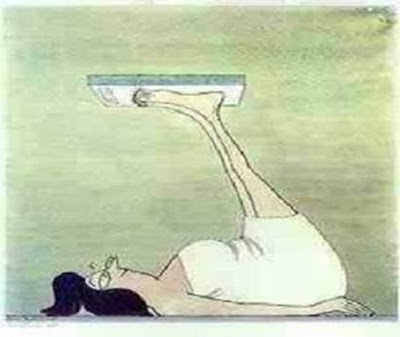 The correct way to weigh yourself. I can't believe I've been doing it wrong all these years! How Warren Jeffs was really caught. Have a great day! And, remember it takes muscle power and burns calories when you smile! I have lost one more pound, how did you do? On another note, my design team has been posting some AWESOME stuff lately and I wanted to share! 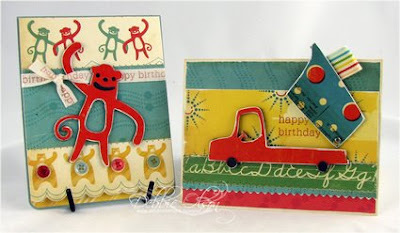 From Debbie Olson, some cute birthday cards. The dump truck lifts up to reveal the message underneath! She has lots more fabulous ideas on her blog! Over in Holland, Natasha has been creating super fun Blackboard boxes! Open this one up to find a scary surprise! I always love Danielle's layouts. Her style is so clean and simple, yet always fresh! Even while pregnant and completely sick, Leah has created some really beautiful projects. This one is my favorite of her recent work. 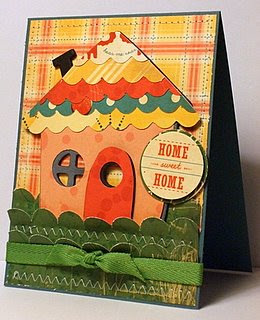 She has a fun online tutorial for a similar layout on her blog. Maren creates more cards than anyone I know. 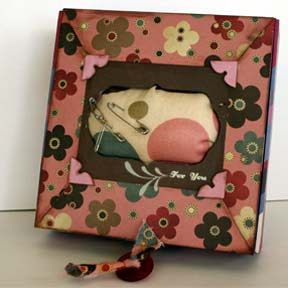 Look for a bunch of her work in Stamp It Cards volume 3 (by Paper Crafts). It comes out in February. Yukari has such a fun, free-spirited style. I saw this first on Two Peas and I knew it was her work, just from the style! I have no idea what she talks about on her blog (it's in Japanese), but the layouts are inspiring!! 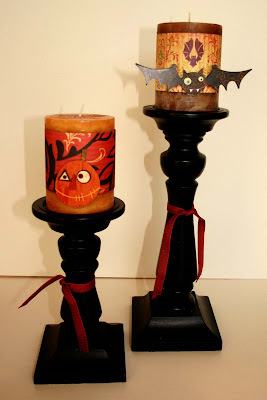 I decided to dress up my candles for Halloween. 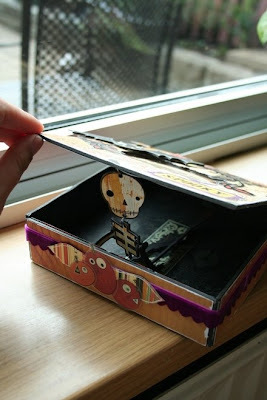 This is a horrible photo, but really cute project! And, it can be completed in about 5 minutes!! 1. Cut strips of patterned paper. 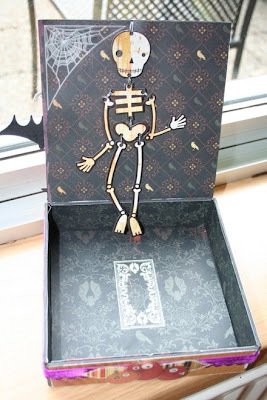 I used our Haunted Collection: Gothic and Macabre. My strips are 2.5 inches wide, but you may want to change that depending on the size of your candles. Then wrap the paper around the candles and adhere. 2. Cover your blackboard elements from the Haunted Blackboard Shapes with their matching adhesive die-cuts and adhere to paper. 3. Tie matching Haunted ribbon around candle holder. 4. Watch your kids get really excited because now they know for sure that Halloween is getting close! 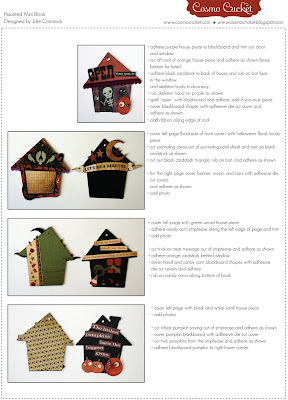 PS: You can complete today's and yesterday's projects with the same set of Haunted Blackboard and Die-cuts. 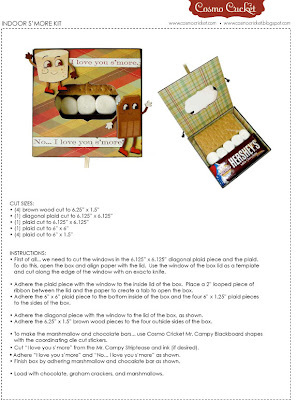 This is such a fun and easy project! They showed it on air when I was on Studio 5 (KSL's local daytime show). If you would like to make one for yourself, or something similar, here's what to do. 1. The frame was purchased at my local craft store for $14.00. It's actually not a frame, it was a blank, metal sign. So, I simply covered over the flat metal center with paper, using a tape runner to adhere it in place. 2. Then I wrapped our Vintage Mix Blackboard with yellow thread. This is the most difficult and time consuming part of the project (it took about 15 minutes and my 11 year old could have done it just as fast). Here are my tips: use a glue dot to stick your thread to the back of the blackboard letter. For letters with holes (O, P, A) use a needle to help you wind the thread through the holes. Finish off by sticking a second glue dot down over the thread, then stick in place (no more adhesive is necessary..... the glue dots will do the trick). 3. 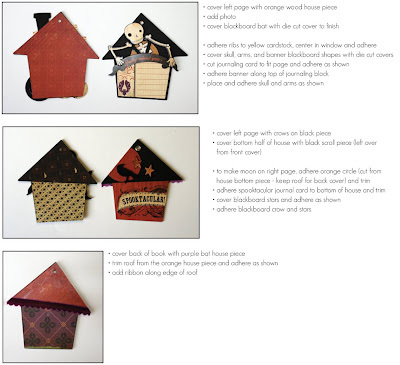 Cover over your Haunted Blackboard shapes with their matching die-cut stickers and adhere as shown. 4. You're done! If you want me to make this harder with lots more steps and complicated instructions, I can, but I really don't think it's necessary. Congratulations Houston and NanaBeth, send us your addresses and we'll send you your prizes! For everyone that wants to see, here is the link to my TV debut and the instructions for this project are below. The program I was on today does not have the video available online, but I'll be photographing the projects and posting them here in the near future. Well, the scale didn't. It remained the same, which I am thrilled with considering everything I ate last week! Eric told me I was great on TV, but being my husband, he's not the most accurate opinion out there. Lindsay hasn't seen it yet, so I'll wait for the truth from him. I can't bring myself to watch it. You know the drill. I'll pick two winners tomorrow to make up for last week! I had a great time at Scrapfest! Thanks to all who stopped by to see me. It's so fun to meet some of you in person. Since I was gone, I didn't update last week's weigh in with a winner and so I'll choose two this week. I'm a little worried about the weigh in since our booth at Scrapfest was right around the corner from the really good chocolate and I ate Olive Garden alfredo at the Crop Around Towns Friday and Saturday nights. We'll just have to hope that being on my feet all day burned enough calories to compensate! For those of you not in the beehive state, I'll try and upload a video. If I can't figure that out, I'll be sure to upload a project sheet so you can at least see what we made! Ten pounds lost that is!!! The scale gods have smiled on me once again and I am down two more pounds! How did everyone else do? And, before I end this post, can I just say thanks for all the kind words and encouragement last week. I did not eat even one little Donette, but I was very tempted!! Enjoy this little card, if I could, I would make one for each of you for all your support! 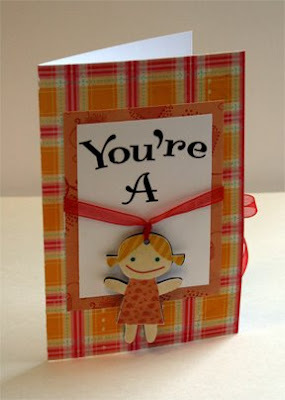 I always call my little girls "doll face" and so this "You're a doll card" is perfect for them. The doll is from Jack's World Blackboard shapes and I just covered it with the matching adhesive diecuts. The title is made with our Scripty Rub-ons. I hung the doll on ribbon long enough to be a young girl's necklace and just threaded it through slits on the card. This is the first version, in subsequent versions, I run the ribbon through both sides of the card and tie it closed. PS: This would have been even funnier if I weren't so darn pale. The powdered sugar doesn't show up as well against my ultra-white skin in the low res version of the movie! The scale did not budge this morning! Could it be my diet? Definitely not, even with Lynette and Lindsay tempting me at the Halfway Cafe (our nickname for the diner by the office) I ate very healthy. I didn't even have popcorn or treats at the movies!! Could it be not drinking enough fluids? No!!! I drink at least 8 cups of water a day, usually more. And yes, I am taking many more trips to the ladies room. Could it be a lack of exercise? Well, maybe. I did skip two workouts last week with the holiday weekend and my anniversary. But, that still means I did four workouts. I was hoping for at least one pound lost! Could two workouts really make that much difference? Have I hit the dreaded plateau? Am I destined to remain at this weight indefinitely? Am I over-reacting? Is there such a thing as over-reacting when it comes to numbers on a scale? Who will the next winner be? Oh, the mysteries of life!! Can you believe it, Eric and I have been married for 15 years (yeah, we Utah girls get married pretty young). This would be our "Crystal Anniversary", but I don't really have a need for any crystal. I think that every year should be our chocolate anniversary instead. Darn! I'm forgetting it's Weigh in Wednesday tomorrow, no chocolate for me! 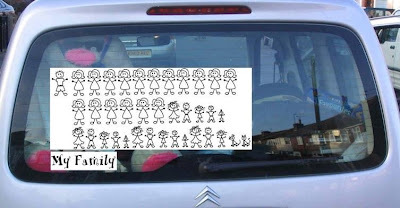 Instead I'll share this super cute project sent to us by Brittney Smith. The only thing I think I would change are the name tags (For Him?!?!?........ no way!! ).